Impeccable 3 bedroom+DEN carriage home, located in the highly sought after community of Somerset at The Plantation. This light and airy home is a must see. With beautifully designed custom tray ceilings, raised panel high end cabinetry, granite counter tops, stainless steel appliances, crown molding and a mitered glass shower enclosure in the master, these luxurious upgrades are phenomenal. In addition, this home features a 2-car garage, roll down hurricane shutters and lingering lake views from the over-sized screened in 2nd floor balcony. Within Plantation, you can enjoy life without ever leaving the community. Somerset boasts one of the nicest 18-hole semi-private golf courses around and is an active community that offers resort-style amenities including a 38,000 sq ft clubhouse, swimming pool, fitness center, tennis courts and more. Conveniently located in the Daniels Corridor, this gated community is just minutes from some of Southwest Florida’s prime attractions including SWFL Airport, access to I-75, Gulf Coast Town Center and JetBlue Park. Whether you are looking for the ultimate golfing lifestyle or a tropical paradise, you will find it all within The Plantation! Situated in one of the most desirable places to live in Fort Myers, this lovely condo is immaculate and located in the award winning, resort-style community of Paseo. With magnificent lake views from the charming open-air balcony and the bright and airy feel inside, this condo is a must see. The open-concept floor plan boasts stainless steel appliances, 42” cream colored cabinets with crown molding, 18” tile, upgraded carpet, a built-in desk and privacy shades. It also includes an attached 2-car garage, impact glass throughout and epoxy flooring in the garage. The Village Center at Paseo is one of a kind! With 26,000 sq ft the amenities are abundant and include a resort-style pool, full-service concierge, ice cream parlor, pub, coffee shop, fitness center, business center, spa services, movie theatre, lap pool, children’s water playground, tennis courts, fishing pier, bocce ball courts and a basketball court. This condo offers the ease of maintenance-free living along with a very socially, active lifestyle. Call today to tour this fabulous Floridian retreat. This immaculate 5 bedroom + loft & bonus room single-family home is a must see in Reflection Isles. With nearly 3,300 sq ft of living area, the spacious floor plan boasts NEW wood-look diagonal tile floors, stainless steel appliances with a top of the line 4 compartment Samsung refrigerator, crown molding throughout, granite counter tops, 3 full bathrooms, custom built-ins and a beautifully designed barn door in master for privacy. In addition, the home features a built-in HD projector with a motorized 100” screen and surround sound. The home also showcases an extended screened in lanai space that makes way to a massive backyard (with plenty of room for a pool) that comes complete with a custom playground. The home is equipped with an alarm system, hurricane shutters and an extra deep 3-car garage w/ utility sink. Situated in the highly sought after Daniels corridor, this community boasts LOW HOA FEES, gated access, community pool and spa, tennis courts, playground and more. This desirable location is just minutes from Southwest Florida International Airport, I-75, Boston Red Sox and Minnesota Twins Spring Training Stadiums, Gulf Coast Town Center and Bell Tower Shops. Call today! This custom 5 bedroom + den estate home sits tucked away on a sprawling 2 ¼ acres in coveted Naples location. The captivating lush, tree-lined driveway makes way to the ultra private home that offers more than 3,600 square feet of living area and upgrades galore. Soaring 14 foot ceilings, wood burning fireplace, oversized 3-car garage, alarm, surround sound and crown molding throughout. The chef inspired kitchen has been completely remodeled with an island and soft close 42” cabinets, double ovens and KitchenAid appliances. The impressive master bedroom suite is oversized and features 2 walk in closets, a double tray ceiling, dual vanities and a walk around shower with 2 shower heads. Outside, the ambiance is just as exceptional with picturesque views of the private heated pool and spa. The screened-in lanai boasts ample entertaining space along with a custom built firepit and raised planter boxes in the wooded yard. The attention to detail make this truly one-of-a-kind. Conveniently located with easy access to I-75 and downtown Naples. Call today to tour this extraordinary home. This beautifully landscaped 4 bedroom home is situated on a lake with magnificent water views in the lovely Sherwood Community. The home boasts 42” cabinets with crown molding, a travertine backsplash, solid surface counter tops and a built-in kitchen desk. In addition, a 2-car garage, hurricane shutters and surround sound wiring are a few of the other desirable upgrades. Sherwood is conveniently located and offers easy access to I-75, shopping, dining and schools. Call to tour this exceptional single-family, lake view home today. Located in the remarkable, resort-style community of Verandah, this 2 bedroom plus Den coach home features tropical waterfront and beautiful sunset views from the 2nd story screened-in balcony. Inside, the ambience is just as exceptional. Vaulted ceilings, plantation shutters, stainless steel appliances, solid surface countertops and tile in the main living areas are just a few of the lovely upgrades. In addition, this home boasts an attached garage, newer AC, alarm system and impact glass. If you have a love for the outdoors, Verandah offers it all. 2 championship golf courses, tennis, newly renovated clubhouse with dining, 9+ miles of biking & walking trails, a community park, dog park, community pool, state-of-the-art fitness center and kayaking along the Orange River. Enjoy nature and the ease of maintenance-free living within this very socially, active community. Just 1.5 miles south of the Caloosahatchee River and close proximity to both Southwest Florida International and Punta Gorda Airports. Call today to schedule a tour. This 5 bedroom, 2 bathroom single-family POOL HOME is located in GATED community of The Estates at Estero River! In addition to the heated pool, this lovely home features a 2-car garage, a large upstairs loft area and tile and wood laminate throughout the living areas. The Estates at Estero River is a nice, quiet family community that offers a canoe and kayak launch with access to the Koreshan State Park and the Gulf of Mexico. Residents also enjoy the picnic area and gazebo. This community boasts LOW HOA FEES and is conveniently located off Corkscrew Road and Sandy Lane and is directly across from the Estero Community Park Recreation Center and just a few minutes from Gulf Coast Town Center, Miromar Outlets, Coconut Point and I-75. (Fort Myers, FL – October 20, 2017) – Hurricane Irma damaged homes and properties across Southwest Florida. 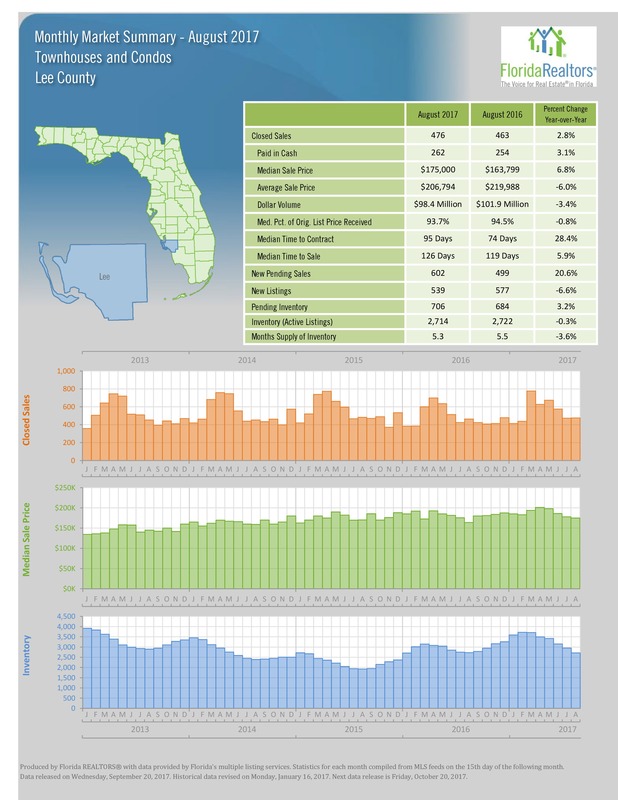 The storm also did major damage on home sales in Lee County in September, which is to be expected. Closed Sales and New Pending Sales took huge hits, and it took much longer for listings to go to contract. Closed Sales for Single Family Homes dropped more than 30% compared to last September. There were 699 Closed Sales, compared to 1,005 last year. There was a drop of 15.5% in Closed Condo Sales, going from 425 to 359. New Pending Sales saw the most significant drops. Single Family Homes dropped almost 48%, while Condos dropped more than 40%. Median Time to Contract rocketed from 55 days to 71 days, an increase of 29.1%. Looking at Single Family Home sales broken down by city, every city listed saw a drop in the number of sales, except for Estero, which stayed even, compared to September 2016. When broken down by price point, Closed Single Family Home Sales dropped as well, except for $400,000-$599,999, which saw an increase of 8.4% year-over-year. A few categories did not see much impact from the hurricane. Active listings only dropped 4.3% for Single Family Homes, and 2.3% for Condos. Median Sale Price increased 13.3% for Single Family, and stayed the same for Condos. Hurricane Irmas impact could be felt across the entire state of Florida. 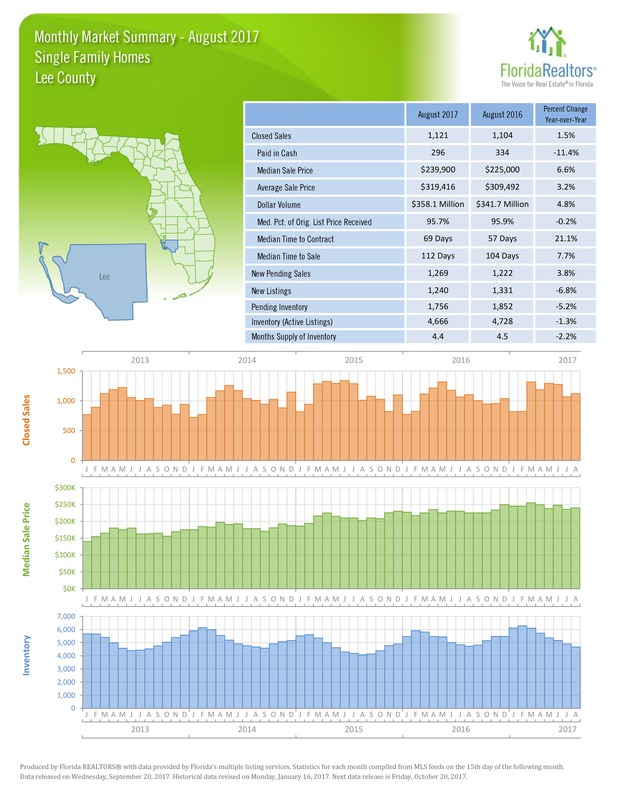 According to Florida Realtors®, Single Family sales statewide were down 20.4% compared to September 2016. Information valid as of October 23, 2017. Please contact us for the most current information and status of these properties. Situated in one of the most desirable places to live in Fort Myers, this lovely townhome is immaculate and located in the award winning, resort-style community of Paseo. With soaring ceilings, decorative niches and archways throughout, this townhome offers a unique charm. This Santa Isabella floor plan boasts stainless steel appliances, 42” cabinets, diagonal tile, a large built-in double desk and custom closets in the master bedroom. The home is clean, clean, clean and has never been rented. It also includes an attached garage, impact glass throughout and an alarm system. The Village Center at Paseo is one of a kind! With 26,000 sq ft the amenities are abundant and include a resort-style pool, full-service concierge, ice cream parlor, pub, coffee shop, fitness center, business center, spa services, movie theatre, lap pool, children’s water playground, tennis courts, fishing pier, bocce ball courts and a basketball court. This townhome offers the ease of maintenance-free living along with a very socially, active lifestyle. Call today to tour this fabulous Floridian retreat. (Fort Myers, FL – September 21, 2017) – According to the latest data just released by Florida Realtors®, Condos skyrocketed in popularity last month. Properties spent more time on the market in August than usual, but sale prices were up. The number of Pending Sales for Condos shot up more than 20% year-over-year in August. There were 602 Condos that were listed as New Pending Sales, compared to 499 in 2016. Single Family Home Pending Sales were up almost 4%, from 1,222 to 1,269. Median Sale Prices were up slightly for both Single Family and Condos. Single Family Homes sold for a Median Price of $239,900, compared to $225,000 a year ago, a change of 6.6%. Condos sold for a Median Price of $175,000, up almost 7% from $163,799 in August 2016. Single Family Homes sat on the market a lot longer in August (69 days) than they did at the same time last year (57 days). The Months Supply of Inventory was relatively unchanged from 4.5 months last year to 4.4 months this year. City-by-city, Fort Myers Beach and Pine Island had the biggest jumps in the number of Closed Sales last month. Sanibel/Captiva saw the biggest drop. At the same time, Sanibel/Captiva saw the biggest drop in Median Sale price year-over-year, while Pine Island saw the biggest jump. 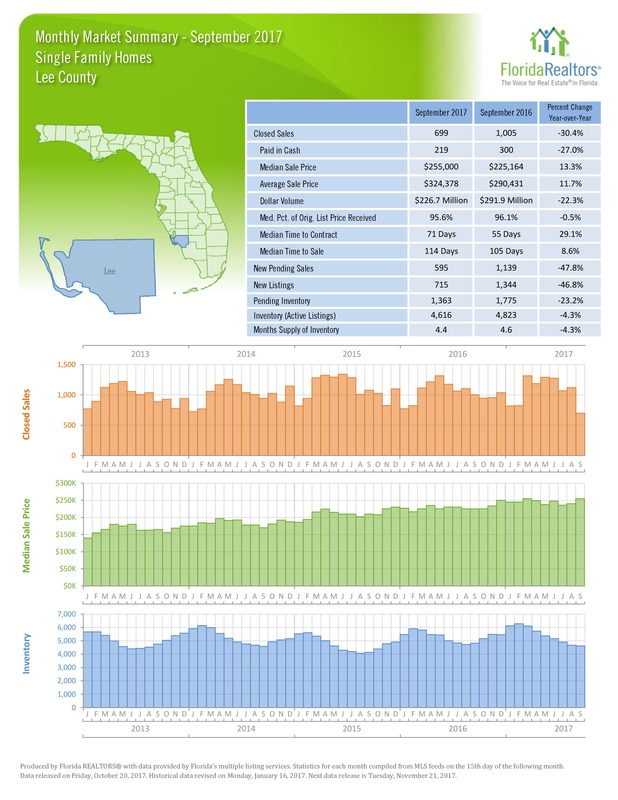 August Home Sales Show Increased Consumer Confidence Naples, Fla.
Information valid as of September 19, 2017. Please contact us for the most current information and status of these properties. This spacious two-story home is located in one of the most “family-friendly” communities within Gateway. With 3 bedrooms and a loft, the interior boasts plenty of room for the entire family. The master ensuite features dual sinks and a separate tub and shower and is conveniently situated on the first floor, along with a formal dining area, eat in kitchen and a large great room. In addition, the home offers beautiful archways throughout and an oversized 3-car garage. The screened-in lanai makes way to an expansive backyard, with ample room for a pool. Stoneybrook offers LOW HOA FEES with an abundance of amenities including a clubhouse, fitness center, heated pool and spa, kiddie pool, playground, basketball courts, tennis courts, beach volleyball court, in-line hockey rink, baseball field, walking/jogging paths and much more. This gated community is conveniently located and just minutes from the airport, JetBlue Park, schools, Gulf Coast Town Center and I-75. Call today for your very own personalized showing.